The day Arunachal Pradesh attains political maturity by imbibing true values of democratic processes, the state can make a lot of developments both politically and economically. 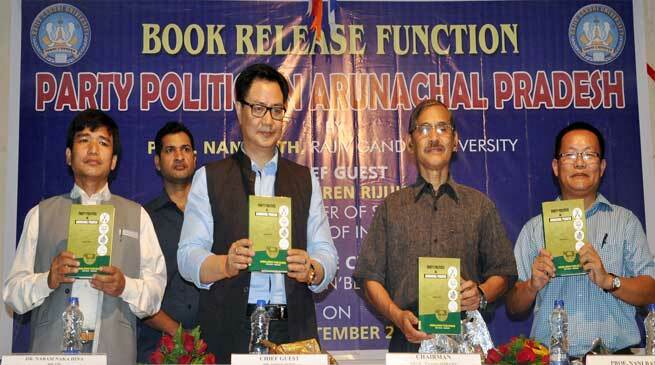 Rising above narrow political interests and looking at larger political perspective for overall development of the people should be the ideology of all political parties, stated Kiren Rijiju, MoS (Home) on Wednesday while releasing a book, titled, Party Politics in Arunachal Pradesh authored by Prof Nani Bath at Rajiv Gandhi University, Doimukh. While complementing Proff Nani Bath for writing the book, Rijiju appealed the people to read it to know history of politics in Arunachal Pradesh and offer constructive criticism through various media and social platforms for a healthy appraisal of the views expressed by the author. Elaborating on his views of political development over the years in the state, the Minister said that political ideology needs to be infused in the people and only ideologies should drive agenda of politics in elections. Commenting on the right of political representatives to change their loyalties and choosing leaders in parties, Rijiju said, Let actual right be vested with the people although MLAs have right to decide their leadership in their parties. The Minister also lamented about the growing unemployment in the state where natural resources abound and only eight lakh indigenous populations live, he also urged all to accord economic issues along with respective political ideology as the main agenda in elections. This will facilitate inculcation of ideology and consciousness among the masses, he added. Earlier, the author, Proff Nani Bath explained the backdrop behind the writing of the book in which many young research scholars travelled all over the state for research on the subject. He informed that the people of Arunachal Pradesh have been most actively participating in both local and state electoral process ever since the introduction of Panchayati Raj in 1969. According to the author, another positive feature of the states political culture is No party is based on communal affiliations in political spectrum in the state. Calling it a positive development, he expressed belief that with arrival of young generation political leaders parties will attain maturity. Proff Bath also termed Rijiju as a symbol of Young generation politician and hoped that politics in the state in general would turn for the better with emergence of such leaders. Presiding over the function, Proff Tamo Mibang while complementing the author, stressed on good governance in Arunachal Pradesh. He said that with the coming of good governance, all existing ills of governance and political and economic problems would come to an end.The book, dedicated to late Bakin Pertin, is sponsored by University Grants Commission and published by Himalayan Publishers.